The National Venture Capital Association recently named Charlottesville the fastest growing venture capital ecosystem in the United States. Six of the nine top companies contributing to that growth trace their roots to UVA. The University of Virginia’s hometown has long been a hub of innovation, but in the last five years Charlottesville has exploded with entrepreneurial growth. The National Venture Capital Association recently ranked Charlottesville as the fastest-growing venture capital ecosystem in the United States. Between 2010 and 2015, venture funding in Charlottesville jumped from $250,000 to $27.7 million invested in local companies, the organization said. UVA is a driving force behind this rapid growth. Nine leading companies in Charlottesville were the primary recipients of that $27.7 million in investments; of those, six have worked directly with the UVA Licensing & Ventures Group to launch, grow and help bring University research to the commercial market. “For each start-up we work with, we’re committed to helping them recruit excellent talent and build strong partnerships,” said Michael Straightiff, the Licensing & Venture Group’s executive director. The Licensing & Ventures Group works with UVA researchers to protect their intellectual property, license University technology to independent companies and launch new businesses. They offer progressive licensing strategies, an entrepreneur-in-residence program and local office space, and recently started the UVA Seed Fund, which provides early-stage investment to selected start-ups. 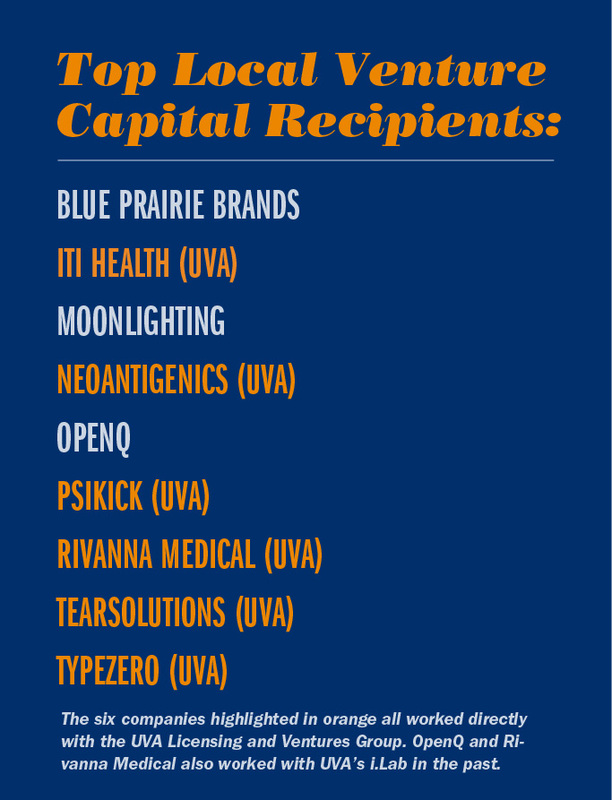 Many of the companies that work with the Licensing & Venture Group now are run by teams of UVA faculty and alumni. Richardson, an alumnus of UVA’s McIntire School of Commerce, helped found PsiKick with UVA professor of electrical and computer engineering Benton Calhoun and University of Michigan professor of electrical engineering and computer science David Wentzloff. Their company is using UVA-patented technology to create ultra-low-power circuit technology and self-powered wireless sensors. Like many local companies, PsiKick also benefits from a ready supply of UVA-trained minds. The company has hired student interns and has several full-time employees who earned graduate degrees from the University. In addition to the resources available through the Licensing & Ventures Group, Straightiff said that UVA has a powerful entrepreneurial ecosystem that encourages start-up-minded students and faculty to spark new innovation in Charlottesville. Undergraduates in any school can get a taste for the start-up world with a new entrepreneurship minor, already one of the University’s largest interdisciplinary degree programs. Through Darden’s Batten Institute and McIntire’s Galant Center for Entrepreneurship, every student also has access to start-up competitions, courses and immersive experiences throughout the academic year. For graduate students in the Darden School of Business, the Batten Institute for Entrepreneurship and Innovation offers rigorous academic and experiential opportunities for would-be entrepreneurs. 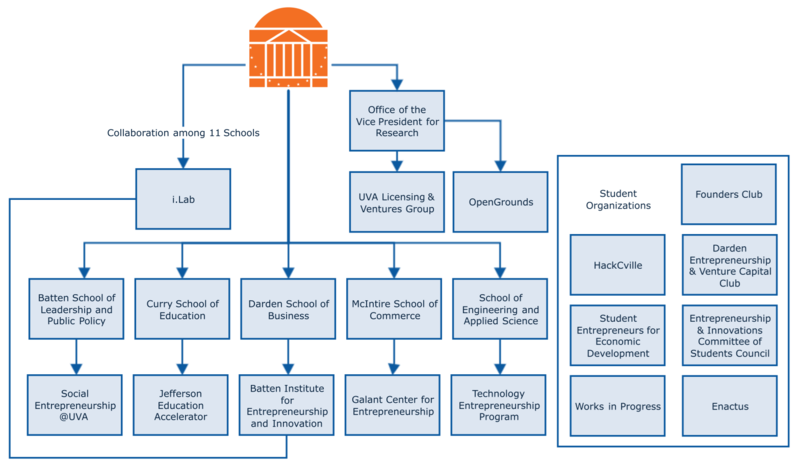 The UVA i.Lab, launched in 2011 as an initiative of Batten Institute, is now a University-wide hub for venture creation and development. Home to the University’s only competitive business incubator, the i.Lab offers coaching, workshops and a vibrant community of innovators and founders. The i.Lab’s flagship 10-week accelerator program is open to anyone in the Charlottesville community, as well as to current students and faculty. It provides workspace, grant funding, intensive guidance and support for budding entrepreneurs. Since its inception, the i.Lab has spawned numerous successful ventures, many of which remain in Charlottesville and contribute to the local culture of innovation. The popular wedding planning site Borrowed & Blue and the growing pharmaceutical company Diffusion Pharmaceuticals Inc. are just a few that can trace their roots to the i.Lab. As a major center for biomedical research, the UVA Health System is another key supporter of Charlottesville’s start-up culture. Companies like TypeZero – one of the nine listed by the association – benefit from research and clinical trial partnerships with the Health System. Straightiff said that in the years to come, the area is likely to see an even further expansion of venture capital investment, as the University forms new community connections and more UVA graduates put their entrepreneurial education to use. The University of Virginia’s Seed Fund is a powerful new avenue for commercializing UVA innovation and intellectual property. It will offer an unprecedented level of early-stage financial support to UVA-based start-ups. The new entrepreneurship minor features both social and technology entrepreneurship concentrations. It represents the collaborative efforts of seven schools, and is still growing. Darden graduates Sarah Rumbaugh and Zach Mayo are playing matchmaker to their fellow MBAs. Their new job recruiting platform, RelishMBA, helps business school students find success by treating their job search like a prolonged courtship.